The death of Robin Williams this week has deeply saddened me. I know that my sentiments are matched by millions of people around the world who loved him for his humor, his acting brilliance, and his generosity. The world clearly lost a singular human being this week. We all have times when we feel low. I doubt my depression has ever been as deep as the moments Robin Williams struggled with, and I’ve never seriously thought of committing suicide. 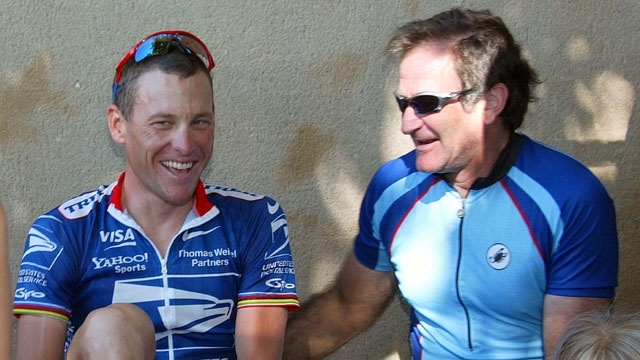 On Robin Williams’ scale, my lows are mere rollers, hardly worth noticing…as are my highs. We all need the broken brilliance of people like Robin to re-enforce both the best and worst of the human condition. Here’s the thing that I can’t stop thinking about: he had identified the same coping mechanisms that I use to pull myself up from my lowest moments. He had friends and a family who loved him. He was connected to the world – through movies, and comedy, and charity. And he knew the power of exercise — he loved to bike, just as I do. It truly is the closest thing to flying we’ll ever feel. He lived in this beautiful city, surrounded by people who loved him, and shared my hobbies. I am saddened beyond belief for the man behind the movies and the fancy bikes. I hope he’s achieved the measure of peace he never found on Earth.